"We offer you economy,efficiency, dedication, professionalism, and reliability. As one of the leading hurricane windows & doors manufacturers in South Florida." Begin the dealer application process today! Existing dealers please enter through the dealer portal. Have a question or concern? Please fill out our form or call us and one of our representatives will be more than happy to assist you. We’re proud to say all materials used in our manufacturing process are 100% American! Eco Window Systems has been open for over ten years and is one of the lead producers of Windows and Doors so you know your quality is guaranteed. Our Impact Windows and Doors not only offer you safety but can help you save money on electrical bills. Our sectional garage door is usually constructed from three to five panels and slides up and occupies the same amount of internal garage space. 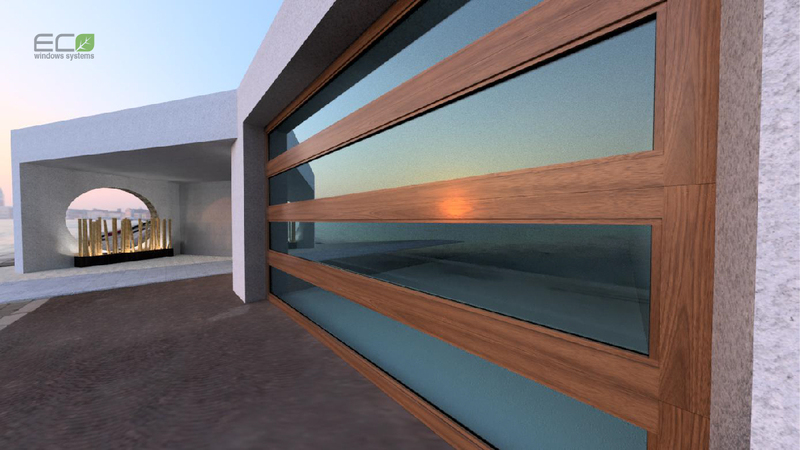 This beautiful door is made of reinforced aluminum, heat-strengthened glass and stainless-steel fittings. They’re Hurricane and impact proof while providing a functional and solid design capable of looking more than great in any home or business. We are pleased to say that we have a large selection of impact windows, capable of facing any natural disaster that occur more often these days. Our windows are made and designed to fit large openings, be more resistant and have an exceptional appearance. From design to toughness our doors are made by proud workers who make sure details, quality, and functionality in every product and every Residential and Commercial door are faultless. These doors are approved by Miami Dade County for your home or business and they are all Hurricane and strong impact resistant. Sister Company Eco Glass opens it’s doors and begins producing glass for Eco Window Systems.